Can Maryland recover from potentially losing its entire starting five? The Terps have already lost three starters in Rasheed Sulaimon, Jake Layman and Robert Carter, Jr., and two more (Melo Trimble and Diamond Stone) are deciding whether to return to school or declare for the NBA Draft. Just how effective would an entirely new starting five be for Mark Turgeon? Maryland would need four-star point guard Anthony Cowan to play a lot early – possibly even start in Trimble’s place. Guard Dion Wiley showed some promise as a freshman before missing all of this season with an injury. Forward Michal Cekovsky also projects to play more, and his rim protection combined with a solid offensive game make him a breakout candidate. Role players Jared Nickens and Damonte Dodd only offer three-point shooting and post defense, respectively. Either as a starter wouldn’t be ideal. Unless Maryland pulls a recruiting coup and lands five-star wing Terrance Ferguson, its best chance at getting more talent for next year is in the graduate transfer market. That could ultimately determine how the Terps project next season. Will a loaded freshman class outweigh the departure of three seniors? The Spartans have the Big Ten’s top-rated class – ranked No. 3 by Scout.com – led by five-star wings Miles Bridges and Josh Langford. Bridges has one-and-done talent, and Cassius Winston (PG) and Nick Ward (PF) give the Spartans four of the Big Ten’s top six incoming freshmen. Michigan State is also still in the mix for five-stars Josh Jackson and William McDowell-White. 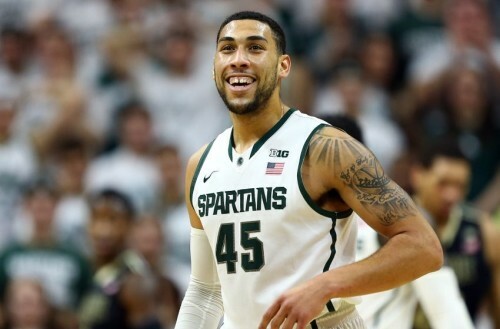 Michigan State loses the Big Ten and AP Player of the Year, Denzel Valentine, in addition to Bryn Frobes and Matt Costello. Forbes was the league’s top three-point shooter (48.1%) while Costello was the only player to average a double-double in Big Ten play this year. Can the talented incoming freshman offset these losses? It’s hard to imagine the Spartans taking much of a step back because their talent is probably the best in the conference. Tum Tum Nairn, Eron Harris, Matt McQuaid and Gavin Schilling are all projected to return, with Deyonta Davis yet to decide whether he will go pro. Adding a loaded freshman class to an experienced returning core should give the Spartans a spot in most preseason national top-10s. How much will Yogi Ferrell’s absence hurt Indiana with a strong core returning? Yogi Ferrell turned out to be one of the best players in Indiana’s long and illustrious basketball history. He is the career assist leader and was the lead guard who led the Hoosiers to two Big Ten titles and two Sweet Sixteens. Indiana is likely to rival Michigan State as a Big Ten favorite next season, especially if Troy Williams decides to stay in Bloomington. The Hoosiers already return a good core of Thomas Bryant, O.G. Anunoby, Robert Johnson, James Blackmon, Jr., Collin Hartman and Juwan Morgan. They add top-50 big man De’Ron Davis and guards Curtis Jones and Grant Gelon. Pittsburgh transfer Josh Newkirk will also be eligible after sitting out this year and should take over the point guard position. Despite the positive outlook on paper, it’s an impossible task to replace the loss of leadership and skill exiting with Ferrell. This entry was posted on Monday, April 11th, 2016 at 2:41 pm by Patrick Engel	and is filed under big ten, feature, microsites. Tagged: A.J. Hammons, Anthony Cowan, bryn forbes, caleb swanigan, Carsen Edwards Purdue, Cassius Winston, Dakota Mathias, Damonte Dodd, De'Ron Davis, Denzel Valentine, Deyonta Davis, Dion Wiley, eron harris, gavin schilling, Indiana Hoosiers, isaac haas, james blackmon jr, Jared Nickens, Josh Jackson, josh langford, josh newkirk, Kendall Stephens, maryland terrapins, Matt Costello, Matt McQuaid, Melo Trimble, Michal Cekovsky, michigan state spartans, Miles Bridges, Nick Ward, O.G. Anunoby, p.j. brown, purdue boilermakers, Raphael Davis, Robert Carter Jr. NBA, robert johnson, ryan cline, Terrance Ferguson, Thomas Bryant, Troy Williams, tum tum nairn, vince edwards, yogi ferrell. You can follow any responses to this entry through the RSS 2.0 feed. You can leave a response, or trackback from your own site.